The ØriginalGrand Wingtip Oxford shows up in style. Crafted in buttery leather and finished with brogue accents, this progressive design cushions with our proprietary Grand.ØS innovation for ultimate walkability. Wingtip oxford in leather uppers. Ultra lightweight shoe. Goes great with dress slacks or khakis. Casual shoe you can wear with almost anything! 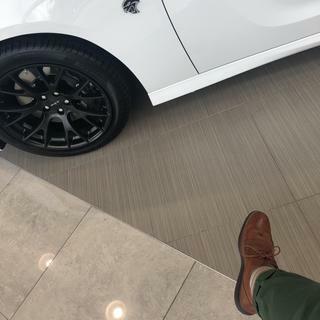 There’s no other shoes in the market it’s starting to become a car sells man trend type of shoes it’s the perfect combo for the car industry that requires lots of walking and white collar uniforms. These were a birthday gift for my son. He really loves them. Especially the versatility! They are a great shoe for business, business casual, and jeans! I would recommend this shoe to any and everyone. An excellent fit. i have had both knees replaced and hard bottom shoes are difficult to stand ; but these have Allow standing morr bearable. I recently purchased the wingtip oxfords and I absolutely love those shoes. I had to suggests these shoes to my father. The comfort of these shoes is amazing. I would definitely recommend the purchase of these shoes. Great shoe, 3rd pair and love them all! Good shoe. Fits true to form. Not as comfortable as the newer evolutions. This shoe is very stylish, yet comfortable. I did notice on the first wear that the shoe rubbed my ankle (specifically the medial malleolus). I hope that subsides once I break them in otherwise i will wear them with thick sock. I haven't worn them with my orthodics yet, but I am sre this will help. Very comfortable and looks good too! Very satisfied I needed a 15W but I ordered a 16M which worked fine. The most comfortable shoes ever. I stand on my feet for 11 hours and this makes me feel like im walking on clouds. 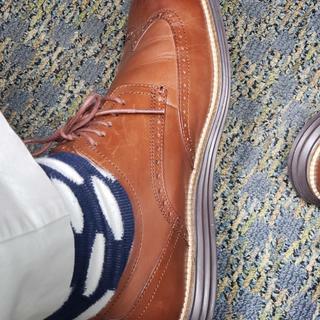 COLE HAAN IS THE TRUTH WHEN IT COMES TO STYLE AND COMFORT. You WILL NOT be disappointed!!! I am always excited to receive my Cole Haan orders. I never have an issue with the shoes I purchase. Cole has quickly become my go to show provider. Love,Love,Love their shoes. Get yourself a pair! You won't be disappointed! Great looking shoes a bit narrow but very comfy once you break them in. Poor quality. After second wear insole of both shoes is already falling apart. Soft Leather - Like walking on a cloud. I have been buying Cole Haan for about two years. Recently I was a bit disappointed with the leather used on the new designs which was great quality but somewhat hard. This shoe brings back the soft leather and I am very happy. Shoes fit great, just as I expected. First pair of shoes I have bought on line so I was a bit apprehensive, but they do fir perfect. Shoes themselves are very comfortable and adaptable to be worn with business attire. Quick and fast delivery - received the next day actually. Shoe fits a little large with a dress sock- But I absolutely love the feel of the shoe and the classic look. Will continue to purchase Cole Haan shoes. Exceptional, just needs a slight fix to the heel! Great shoe all around, could use a softer upper heel! Very comfortable and stylish! Most comfortable shoes out there! Great shoes. I love them. Always comfortable. Get compliments all the time. these are my son in law's favor shoe and has every style that you have all in all I have purchased 5 pairs of shoe for the men in this family this Christmas season. And each one is very happy that I did. These are very popular shoes. They are available in a wide width which allows for comfort when wearing. looks comfortable, stylish, and black soles will be good as I am a plant manager and will wear them in the warehouse. I need something that i can stand in all day at work. looks professional the most professional out of all the ones that have the nice cushion underneath. i wish it were more hidden. They are great to stand in all day! Company peer pressure. Everybody is doing it. Son was very pleased with look and feel. 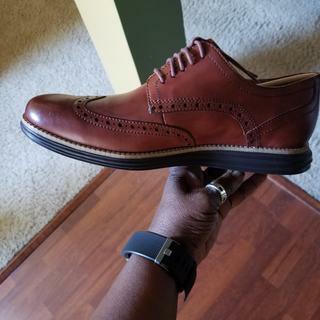 I researched comfortable casual/dress shoes and found the best reviews for the Cole Haan OriginalGrand shoes. I personally like the Wingtip Oxford in Woodbury-java the most for my personal taste and work environment. I'm a teacher and work standing up and walking around ALL DAY so I wanted something VERY cushioned, BUT very dignified as well. They looked comfortable as well as stylish! I needed a comfortable dress shoe. I have owned this shoe in the past in a different style and colour. Overall style is a plus but the comfort is amazing. I have a version of these in the women's style, super comfortable and professional looking for work, I wore them every day working in New York, now getting a pair for my brother! They look very fashionable and according to my husband are very comfortable. It is a gift for him. Classic good looks with superior cushioning. Recommended by a co-worker who said they are the most comfortable pair of dress / casual dress shoes you will find at this price point. Stylish and they look comfortable. I needed something for work. Best comfortable dress shoes I've ever owned. They look great with dress pants, chinos, and jeans. I like the look of the shoe and hope it fits as I have a bunion on my right foot. Most comfortable shoes I’ve owned! Great look, comfortable and I like the color of the sole vs. the lighter soled shoe. I have been waiting a long time for my size to be back in stock. What color cream should I get to cover a scuff on the Woodbury-Java color? Which belt matches best with the Woodbury-Java color shoe? BEST ANSWER: A light brown belt matches perfectly. does the zerogrand wingtip oxford II has the holes in them? BEST ANSWER: The leather has perfs in it but they don't go through the lining, so your sock will not show through the holes. There are dimples in the brogue pattern. I assume that is what your referring to. There are no actual holes. Yes they do and they run small. Is the insole removable for replacement with custom orthotics? Answer is no because it stick well to the bottom . Yes the insoles are removable. Do they carry any dress shoe with safety toe/ steel toe ? BEST ANSWER: We do not manufacture any styles with a reinforced safety toe - but we do have lots of dress shoes for other occasions!